Shooter sounds like he was influenced by those on the left. 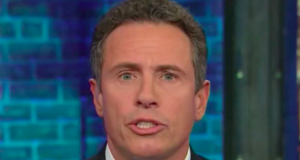 Has Cuomo actually seen what he said? CNN’s Chris Cuomo went on a long diatribe against gun violence on his show Thursday night. Cuomo, who has long been a proponent of stricter gun control, criticized those who send “thoughts and prayers” after a shooting tragedy. The news show host focused on the deadly shooting that occurred Wednesday night at a bar in Thousand Oaks, Calif. where at least 12 people, including Ventura County Sgt. Ron Helus, were killed by a veteran gunman reportedly believed to have PTSD. Cuomo said those praying for the victims actually “mock” them and that “leaving it to God” is not the answer.